Only for Charming's clients: a bottle of wine of Feudi del Pisciotto! Located in the Municipality of Niscemi, in the Province of Caltanisetta, the Pisciotto reserve has extensive vineyards and monumental cork oak trees. Immersed in this paradise of colours and aromas, the Wine Relais I Feudi del Pisciotto is the ideal place to stay if you want to explore south-eastern Sicily. Caltagirone, well known for its exquisite pottery ware, is just 25 minutes away; the Roman Villa del Casale and Piazza Armerina are 30 minutes away. Noto and Siracusa's Greek theatres are not far, and golfers will learn to appreciate the two Donnafugata courses. The closest beach is Scoglitti, about 10 km from the Wine Relais, but the beaches of Licata and Falconara Sicula are not much further. Comiso Airport (35 minutes) and Catania Airport (approx. 60 minutes) are the two closest airports. The unique atmosphere and pleasant style of the Wine Relais I Feudi del Pisciotto is a result of the perfect balance between its modern and traditional features. 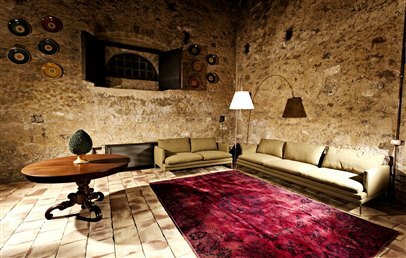 The old 18th century building, originally the largest winery in Sicily, has been artfully reconverted (based on Brandi's approach to restoration) and elegantly furnished. 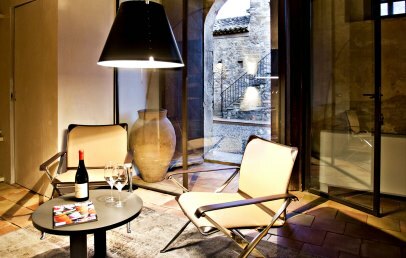 It has 10 rooms and suites, spacious communal areas, a terrace with beautiful views of the vineyards and, of course, a tasting room. Categorised as Classic, Superior, Junior Suite and Prestige, the rooms and suites of the Relais are named after the most famous Italian fashion designers (Versace, Blumarine, Missoni, Alberta Ferretti, Ferrè etc. ), who all collaborated in the creation of our labels. 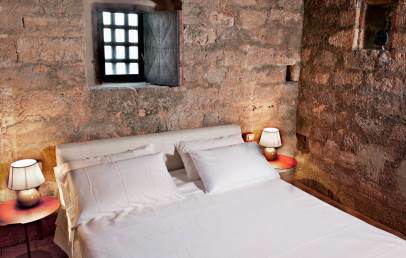 The rooms are set out over two floors, and each one is unique as they are located in the oldest part of the building and preserve many of the original building’s exquisite features – such as the ancient Greek and Roman wine-making tanks. All rooms have satellite TV, mini bar, air conditioning and heating and Wi-Fi. Classic (28 sqm) – Double bedroom with reading area, bathroom with large shower and separate toilet. Patio with views over the vineyards and the Sughereta Nature Park. Superior (40 sqm) – Double bedroom located on the second floor (with no lift), lounge area and bathroom with large shower. Patio with views over the vineyards and the Sughereta Nature Park. Superior Triple (50 sqm) – Double bed plus one single bed, lounge area and bathroom with large shower. Patio with views over the vineyards and the Sughereta Nature Park. Located on the second floor (with no lift). Junior Suite (55 sqm) – Double bed plus one large-size single bed, lounge area and bathroom with shower. Patio with views over the vineyards and the Sughereta Nature Park. Prestige Suite (78 sqm) – laid out over two levels, comprises two double bedrooms (plus a 3rd large-size single bed), lounge and two bathrooms with shower. Patio with views over the vineyards and the Sughereta Nature Park. For breakfast guests can choose from a well-assorted buffet – room service is available on request. Feudi del Pisciotto was the first Sicilian winery to become part of the DCC Group (which includes Castellare di Castellina and Rocca di Frassinello in Tuscany and Gurra di Mare also in Sicily). Guests can savour its outstanding wines in the tasting room, located in the old building, with its glass floor through which you can admire the beautiful oak barrels. The 150-acre vineyard produces wines that have won prizes awarded by international specialized magazines and wine guides and given the highest ratings; their labels have been designed by the best Italian designers, such as Versace and Missoni. The Wine Relais I Feudi del Pisciotto does not have a restaurant of its own, but if you enjoy good food it recommends the Cibus in Niscemi; Coria in Caltagirone; La Madia in Licata; Il Duomo and La Locanda di Don Serafino in Ragusa Ibla. The à la carte restaurant Il Palmento di Feudi was recently opened and is led by the Sicilian chef Massimo Blanco. With his international experience, he manages to delight every palate with flavors of the Sicilian and Mediterranean cuisine. The staff of the Wine Relais I Feudi del Pisciotto will make sure you enjoy your stay and can offer any assistance if you require extra services or suggestions on the best places to visit. A beautiful panoramic swimming pool equipped with deckchairs and shaded areas is available (pool towels are provided in the room). Restaurant – open from Tuesday to Sunday until for lunch (every day lunch and dinner, on Sunday only lunch) from 12:30 to 14:30 and from 19:30 to 22:30. On Sunday for dinner and on Monday for lunch and dinner (closing days of the restaurant) there will be a buffet of 4 courses from appetizers to desserts. As they are located in the oldest part of the building, Classic rooms are all unique and their modern furniture creates a striking contrast with the structure of the old building. The rooms have a reading area and are equipped with satellite TV, mini bar, air conditioning and heating and Wi-Fi. The en-suite bathroom has a large shower (separate toilet), double basin, hairdryer, towel warmer, bathrobes and complimentary toiletries. The patio is equipped with garden furniture and offers views over the vineyards and the Sughereta Nature Park. Located on the second floor (with no lift), in the oldest part of the building, Superior rooms are all unique. 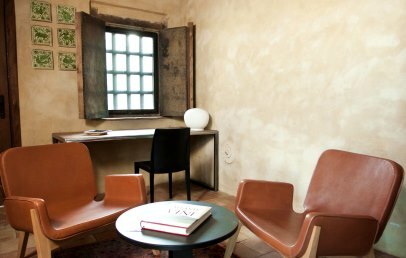 They have modern furniture that creates a striking contrast with the structure of the old building and feature beautiful ceramics from Caltagirone, created by the Artist Giacomo Alessi. The rooms have a lounge area and are equipped with satellite TV, mini bar, air conditioning and heating and Wi-Fi. 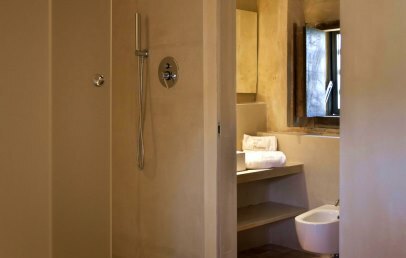 The en-suite bathroom has a large shower, hairdryer, towel warmer, bathrobes and complimentary toiletries. Superior rooms open onto a private terrace with views over the vineyards and the Sughereta Nature Park. 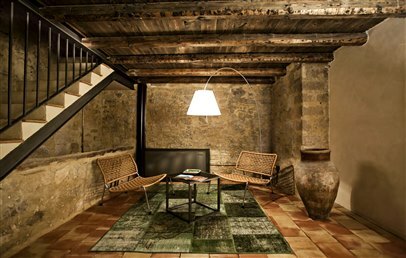 The Superior Triple room (on the second floor, with no lift), located in the oldest part of the building, features modern furniture that creates a striking contrast with the structure of the old building. The room has a lounge area and is equipped with satellite TV, mini bar, air conditioning and heating and Wi-Fi. 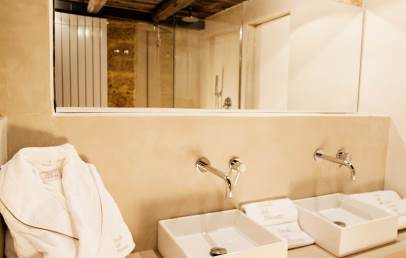 The en-suite bathroom has a large shower, hairdryer, bathrobes and complimentary toiletries. 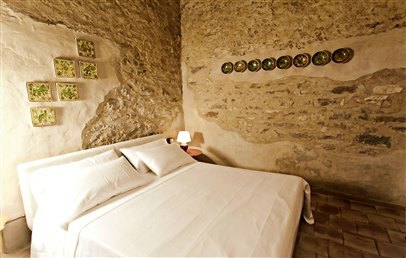 The room opens onto a private terrace with views over the vineyards and the Sughereta Nature Park. 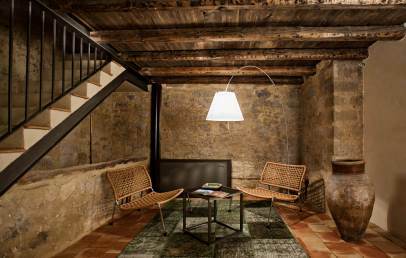 The Junior Suite room, located in the oldest part of the building, features modern furniture that creates a striking contrast with the structure of the old building. The room has a lounge area and is equipped with satellite TV, mini bar, air conditioning and heating and Wi-Fi. The en-suite bathroom has a shower and a double basin, hairdryer, bathrobes and complimentary toiletries. The patio outside the Junior Suite is equipped with garden furniture and offers views over the vineyards and the Sughereta Nature Park. 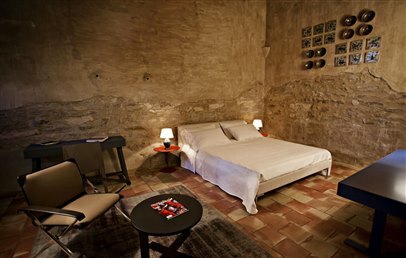 Laid out over two levels the Prestige Suite is located in the West Tower, the oldest and most charming part of the building, which still preserves the original Sicilian cotto tile floors. It comprises two double bedrooms (with optional 3rd queen-size bed on request), lounge and two large bathrooms with elegant fixtures (shower, double basin, hairdryer, towel warmer, bathrobes and complimentary toiletries). It has satellite TV, mini bar, air conditioning and heating and Wi-Fi. The Prestige Suite has an independent entrance and a patio equipped with garden furniture offering views over the vineyards and the Sughereta Nature Park.